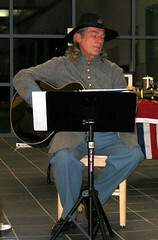 Thursday night, I was at the public library in Greenville, Texas to present my Jim Limber/Civil War program. It was sponsored by the Friends of the Library there. What a wonderful and friendly group of people. A large group of children were also in attendance. Interest in the Civil War and the Jim Limber story was high. After the program, I drove to my parents’ house in Kemp, Oklahoma, visited with them a few minutes, then retired. The next morning, I was on my way to Vicksburg, Mississippi, for my signing at the Bookland there. It was another sell-out. This morning, I’m on my way to the Books-A-Million in Jackson. I love this fast-paced schedule and enjoy the people I’m meeting. However, I find myself craving alone time, to write more and think. I’ll post a more reflective blog entry tonight when I have more time to do that. Below is a photo of my performance at the Greenville Library.